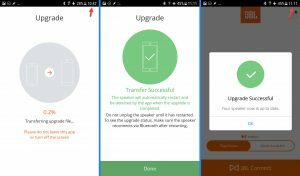 If you would like to skip the details and go straight to the JBL Pulse 2 firmware upgrade procedure click here. When I have first encountered the above mentioned behaviour on a JBL Pulse 2 speaker, my first thought was that the flex cable, connecting the button control board to the main board, wasn’t fully seated in the connector, during the speaker assembly. Upon discovering that the issue is still present after the speaker re-assembly, I was puzzled. While investigating the issue further, I have noticed that the fault is less apparent when the speaker is held in hand. This has lead me to the conclusion that there is some interference coming from a nearby device that uses the same radio frequency for communication. I started the process of elimination by turning off all of the nearby bluetooth devices one by one and in the end, even the wireless router. Unfortunately the issue was still present. 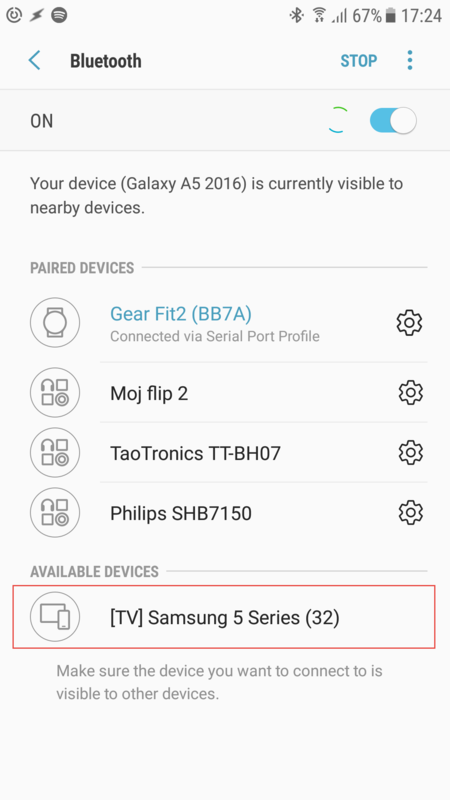 After searching for other nearby bluetooth devices that could possibly interfere with the JBL Pulse 2, one particular device seem to be present in the bluetooth settings on every search – a Samsung Smart TV (Series 5). The issue was I couldn’t turn it off, to confirm my hypothesis, since I didn’t have access to it. The next best option, apart from going door to door and kindly asking every resident in the building if they posses the mentioned Samsung Smart TV and would be willing to turn it off, was taking the speaker as far away from this potential interference as possible. So I went, with my phone in one hand and JBL Pulse 2 in the other. While the distance between me and the nearest building was around 100 meters (330 feet), the Samsung Smart TV was still under available devices in the phones’ bluetooth settings and JBL Pulse 2 was still flashing LEDs like a Christmas tree. Only when I have reached the distance of approximately 200 meters (650 feet) from the nearest building, the Samsung Smart TV disappeared and light-show on the JBL Pulse 2 stopped. I then tried to pair the speaker to my phone – the pairing process completed successfully and JBL Pulse 2 has finally connected to my phone. I tried playing some music – it was working perfectly and without any stutter, the bluetooth connection was rock solid. 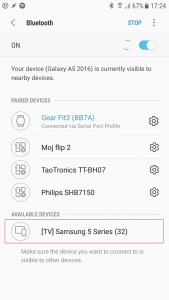 Fortunately, JBL has rectified the susceptibility to bluetooth interference from the Samsung Smart TV Series 5 in the form of a firmware upgrade. 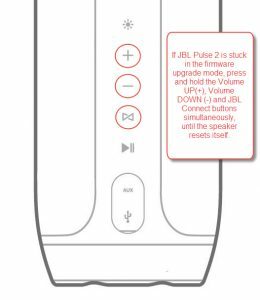 Before attempting the firmware upgrade, it is important to remove the JBL Pulse 2 from the environment in which the mentioned bluetooth interference occurs, otherwise there is a risk of the firmware upgrade failing, which could render the speaker unusable. Update: One of the visitors has notified me that his JBL Pulse 2 is exhibiting same problems as described above, but in his case the reason for the interference was an Apple TV (4th generation). After upgrading the firmware, his JBL Pulse 2 now works without issues. Firmware upgrade on a JBL Pulse 2 is a simple and risk free procedure if it’s performed correctly. Taking shortcuts or not following the exact steps can result in a failed firmware upgrade which could render the speaker unresponsive. Go through all the steps below carefully before attempting the firmware upgrade. *Author of this post is in no way responsible for any damage that could occur by not following the exact steps below. – A JBL Pulse 2 speaker with a fully charged battery. – A charging adapter suitable for JBL Pulse 2 or a charging micro-usb cable and computer with a free USB port. JBL Pulse 2 needs to be connected to a power source during the firmware upgrade, even if it’s fully charged. If you intend to use a laptop for charging the JBL Pulse 2 during the firmware upgrade, make sure its battery is sufficiently charged and will hold for at least 1 hour. The “High Performance” power plan should be selected in the power options, ensuring that the computer will not go to sleep during the firmware upgrade and therefore disconnect power to the JBL Pulse 2. – An Android or Apple phone / tablet with bluetooth, reliable internet connection and a fully charged battery. Firmware upgrade will be performed via JBL Connect app which can be downloaded via Play Store on Android or App Store on IOS. – A stable bluetooth connection between the JBL Pulse 2 and the device from which the firmware upgrade will be performed. This can only be achieved in an environment with no bluetooth interference from Samsung Smart TV Series 5 or similar. Bluetooth stability can be tested by connecting JBL Pulse 2 via bluetooth and playing music for at least half an hour. If there are no connection drops and music is not stuttering, this can be considered a suitable environment. – One hour of your time. Firmware upgrade on a JBL Pulse 2 itself usually takes around 30 minutes, sometimes even a few minutes more. Fully charge your JBL Pulse 2 and take it to the location with no bluetooth interference – if you can play music on your JBL Pulse 2 for at least half an hour without stutter and bluetooth connection dropping, the location can be considered safe for a firmware upgrade. You will also need an Android or Apple device with a reliable internet connection and a wall adapter or a suitable computer that will be able to provide power to the JBL Pulse 2 via USB port, during the firmware upgrade. You can check the version of the current firmware on a JBL Pulse 2 by pressing and holding Volume DOWN and JBL Connect buttons simultaneously while the JBL Pulse 2 is turned on. A pleasant voice will report the version of the current firmware as can be seen on the video below (six-six = firmware version 6.6). You can write down the current firmware version so you can compare it later, to the one after the upgrade, to make sure the firmware upgrade was successful. 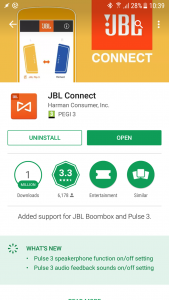 Open the Play Store app on your Android device (App Store on Apple devices) and search for the JBL Connect app. After JBL Connect is installed, you can connect the JBL Pulse 2 to your device via bluetooth. 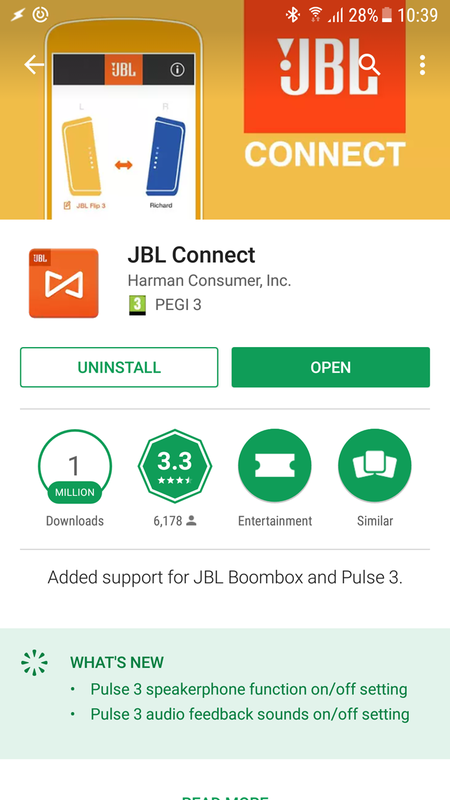 Open the JBL Connect app you have downloaded in the previous step. If JBL Pulse 2 is present in the JBL Connect app and there is a white exclamation mark in an orange circle next to it, that means that the firmware upgrade is available. Now its time to connect the JBL Pulse 2 via charging cable to the wall adapter or computers’ USB port. Make sure that the computer will be able to provide power to the JBL Pulse 2 for the next half an hour and will not go to sleep during the firmware upgrade. It’s best to put the phone into airplane / flight mode to avoid the possibility of an incoming call, since it would disrupt the firmware upgrade procedure. If airplane mode is not an option, the next best thing would be to temporarily re-direct all calls to voicemail or some other number. Also make sure that the phones battery is sufficiently charged and will hold for at least another hour. 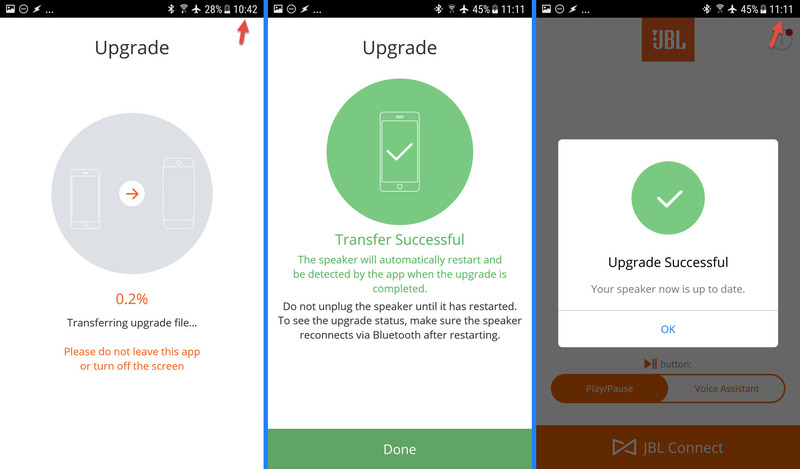 You can start the firmware upgrade by tapping on the orange icon (with white exclamation mark in it) within the JBL Connect app. Tap on the OK button after the “Upgrade Speaker” prompt box appears. Firmware upgrade process on the JBL Pulse 2 will take around 30 minutes as can be seen from the photos below. Be patient during the firmware upgrade and do not try to interrupt it by turning off or disconnecting the power to the JBL Pulse 2 even if the upgrade seem to stall for a few minutes. 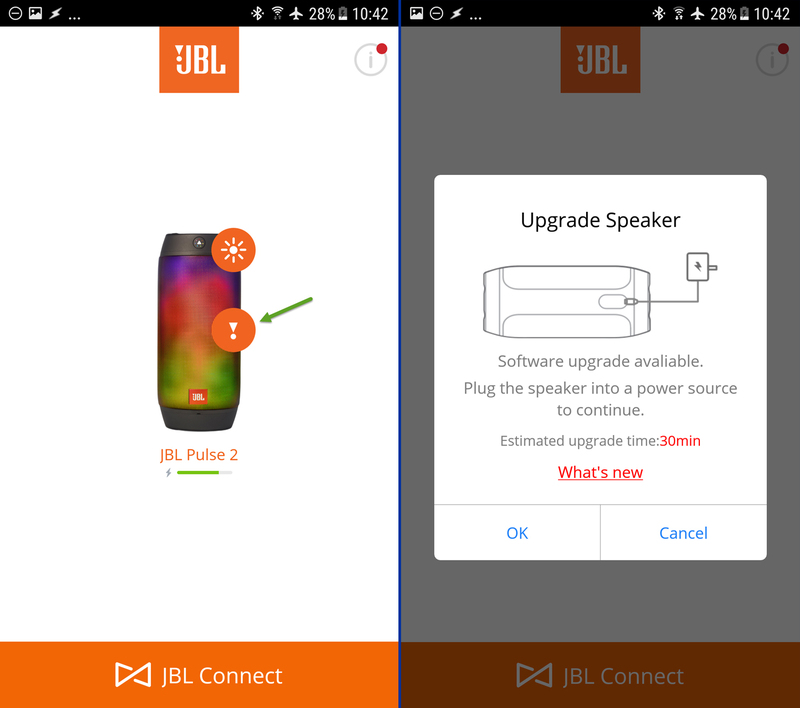 Do not be tempted to disconnect the speaker after the upgrade file has been successfully transferred, because now the most important part of the upgrade procedure begins – microcontroller inside the JBL Pulse 2 will use the transferred firmware file to update itself. This step will take a few minutes and then the JBL Pulse 2 will automatically restart itself and re-connect to your phone. After the firmware upgrade is finished and JBL Pulse 2 is reconnected, a prompt box with the text “Upgrade Successful” will appear. Congratulations, that means you have successfully upgraded the firmware on your JBL Pulse 2. 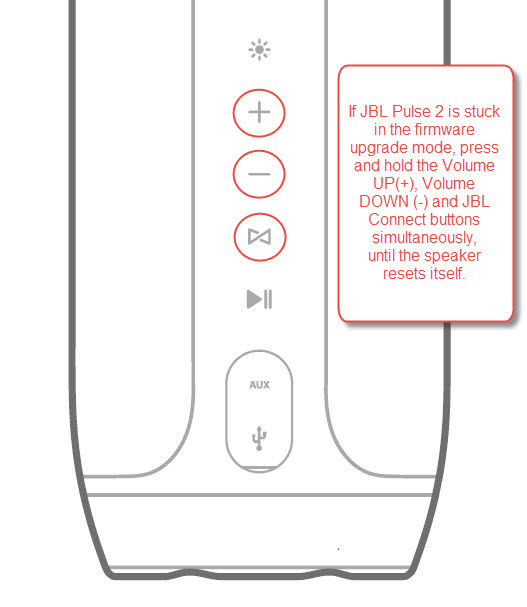 If you wish to confirm that the firmware truly was upgraded, you can do so by pressing and holding Volume DOWN and JBL Connect buttons simultaneously while the JBL Pulse 2 is turned on. The firmware version reported should be higher than the one before the upgrade. In case the firmware upgrade failed or was interrupted by a call, the speaker is probably unresponsive and would not connect to your phone. This means that the microcontroller inside the JBL Pulse 2 is stuck in the firmware upgrade mode. You can exit the firmware upgrade mode by pressing and holding the Volume UP , Volume DOWN and JBL Connect buttons simultaneously until the speaker resets itself. Same issue for me but found out that Apple TV gen 4 was the root cause of the interference. Testing a firmware upgrade as we speak. Keeping my fingers crossed. Please let me know if the firmware upgrade has resolved your issue. Thank God for you. Was having huge problems finding the source of the interference. As soon as I unplugged the Apple TV, my speaker connected without trouble. Thank you! Any ideas what it means if the upgrade button on the JBL app is grayed out and inaccessible? 1. Android / Apple device needs a working internet connection during the firmware check and upgrade process. 2. Battery on JBL Pulse 2 needs to be charged and speaker needs to be connected to the charger. 3. Try updating the JBL Connect app to the latest version. 4. Try doing the firmware upgrade from some other device. Thanks. An update: I tried another device, turned devices off and on, uninstalled and reinstalled the app – same issue every time. I think the Pulse 2 is trying to tell me something but I don’t know what. if the reason for your pairing issues is interference for a nearby device, you could take your JBL Pulse 2 to a different location such as workplace or your friends house and do a firmware upgrade there. Otherwise you could try pairing your JBL Pulse 2 to a different phone, install the JBL Connect and do a firmware upgrade. If JBL Pulse 2 is unable to pair with any device and in different locations, you could try performing a reset (described in the post) or take it to JBL repair centre. Can I only have two Pulse 2 connected? I really thought I could have more. Is there any way to force an upgrade? I just got two more and it says the firmware is 33 but the one I already one is 66.
you can’t force the upgrade, but if speakers have firmware version 3.3, you should be able to upgrade them to 6.6 via JBL Connect app. Unfortunately it seems that JBL Pulse 2 speakers only support Connect feature which allows connecting maximum of two speakers. The newer Connect+ feature should allow for connecting up to 100 speakers. You are welcome. Please update the firmware to fix this issue. Hi, my firmware is updated, but the color sensor keeps turning on when I press any button, the fix for this is pressing the color sensor button. But then, when I turn it off and on, the old firmware is installed again, I tried updating 11 times now with all the same problem. I have never seen an issue like this with JBL Pulse 2, I would need to do diagnostics on it to get more information. My speaker CAN not be turned on..
Connect the JBL Pulse 2 to the charger and then press the Volume up(+) and the JBL Connect buttons at the same time and hold them until the unit turns off. You are welcome Nina and thank you for your comment. Good evening to everyone. I had the same problems described above (sudden Bluetooth disconnection, Bluetooth matching problems-especially with laptop-, light themes and light button turning on and off, audio not working even with 3/5th of battery) even without the interference of any of those above mentioned sources (Apple TV, Samsung TV etc.). I bought it two months ago on Amazon and due to these problems I sent it back. Afterwards they send me an apparently new one (with the seals) which was the same one (same small scratch on the back) hopefully repaired (new battery or whatever). After three days without problems it started to have the same problems and I got panic (also bcs it’s not such an economic speaker…) and I was thinking to send it back again to gain the money back too. But then I saw the exclamation point on the app about a new available upgrade and I started the updating (half an hour, speaker linked to the charger etc. )…now I cross my fingers! please let me know if the firmware upgrade has resolved the issues. Your very easy to follow instructions solved the connectivity issues I was experiencing, despite the company rep stating no firmware upgrade was available. Thanks! Now I just need to get the inferior quality micro-usb port repaired. You are welcome John and thank you for your feedback. otherwise there are also some companies from USA on eBay that offer this kind of service.